Bells of Bastabales, when I hear you ring, I die of solitude. The three verses with which this poem opens are among the best known, most appreciated and more often recited of all those composed by the great Galician poet par excellence, Rosalía de Castro. As part of the essential book Cantares gallegos (“Galician chants)” or sung by singer-songwriters like Amancio Prada, the bells of Bastavales, in Brión, have travelled around the world. Born in Santiago de Compostela in 1837, Rosalía spent part of her childhood in her aunts’ house in the village of Ortoño, in the same valley where the bells she would write about many years later rang. In the famed text, the poet recalls the happy times of a childhood spent between the fertile plains, which shared protagonism in these first years with the lands of Iria Flavia and Padrón, downstream. The poem was written at a time when Rosalía’s life could not be more different from that which she wanted to evoke: always following her husband, Manuel Murguía, from city to city and from work to work, she missed the peaceful existence of the Galician countryside, where she could walk the “path of happiness, and while the sun does not hide I sit on a small rock. And sat I am watching how the moon is coming out, how the sun is lying down. I hurt wounded by pain, that I once had a whole life and today I have half a life. Only a half was left by those who brought me from there, by those who stole me from there”, she wrote. 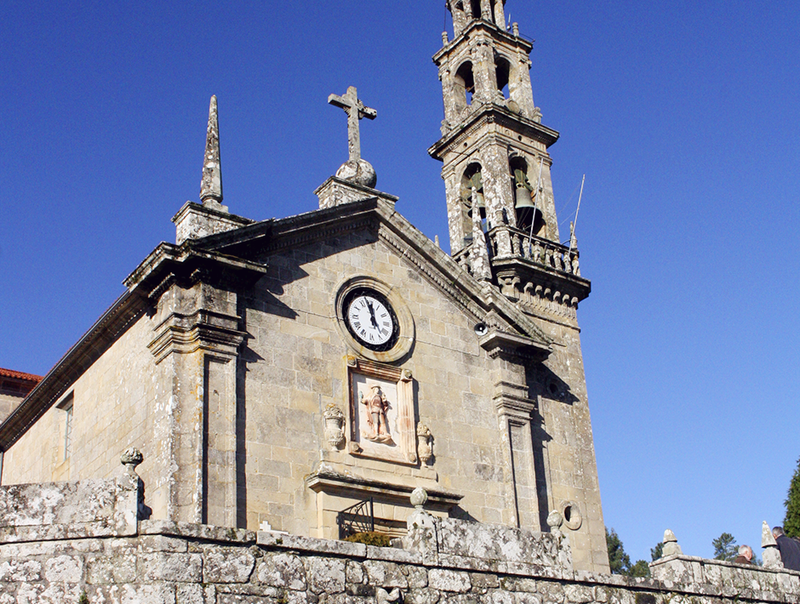 The bells that moved Rosalía were located in the beautiful church of San Xulián de Bastavales, placed on one of the slopes of the Sar valley. The very name of the locality refers to the fertility of the land that irrigates this river, subsidiary of the Ulla, since it comes from the Latin vasta vales, or great valley. The church is a temple built late into the eighteenth century of which, in fact, the tall and light bell tower stands out. Baroque in style and with a sobriety that borders on neoclassical, it was built over a previous Romanesque construction and following a project in which architect Tomás del Río, known for unique works in the interior of the Cathedral of Santiago de Compostela, collaborated. The tower came later, in 1828, at which time the bells that Rosalía recalled throughout her life were placed there. However, and without this change taking away from the beauty of the place, the current bells are no longer the same ones that inspired the famous poem. They were replaced at the beginning of the twentieth century and supplemented in the thirties by a clock that gives even more character to the construction. The location is, however, the great appeal of San Xulián de Bastavales, as its main door opens onto the wide plains of the river Sar, flat, green and fertile, surrounded by soft wooded hills. And, if you know where to look, at the back of the picture, as a surprise, you can even see the towers of the Cathedral of Compostela.